It's hard to believe, looking at the picture of my left hand over there, but I bite my nails. Not just my nails either, as I've told you before, but all of the skin surrounding them as well. On a bad day, I can bite my nail down to a bloody stump in a matter of minutes, and then tear my eponychium to shreds until I'm faint from the blood loss. I'm such a bad nail biter, that I don't even realize I'm doing it until I've mangled a finger or two. I'm so bad, in fact, that I don't think I'll ever be an ex-biter, the best I can do is manage my habit, and take measures to prevent it. So how did someone like me get nails like that? Well, it was actually pretty easy with a little help from nail enhancements. So easy that I believe anyone can do it if they're willing to try. First off, you need to find a good nail tech; if you can find one who's worked with biters before, that's a big plus. You'll need someone who will do a complete consultation with you to figure out what will work best with your habit. They should ask questions about what triggers you to bite or pick, if you've ever been able to stop for a short time, as well as ask questions about your nails themselves. Are they brittle, flakey, bendy? These are things your tech will need to know in order to tailor a rehabilitation program that suits you. So obviously the NSS at the mall isn't going to cut it. My recommendation for most biters is to start off with a Liquid and Powder acrylic overlay. I'll extend the nail a little bit with tips or forms if my client wishes, but extending them too much on a person who's not used to having long nails just isn't a good idea. The reason is because when a client isn't used to long nails they don't know how to manage long nails, and the extensions will be subject to accidental breaking, which can further damage the natural nail. I also prefer Liquid and Powder acrylic over UV Gel acrylic because it's more durable than Gel. Gel overlays are just too brittle to stand up to the beating a recovering biter is going to give them. I want a product that can withstand an occasional chomp from absent minded teeth, so Liquid and Powder is my choice for this circumstance. Now, overlays aren't only for the ladies out there. I can do a very natural looking overlay on a male biter too, and no one will ever know he's wearing an enhancement. So male or female, there's absolutely no excuse to stop your nail biting habit if you want to! Once a biter has successfully worn overlays for a few months, and the natural nail has grown out to the desired length underneath, I'll start talking to the client about maintenance. Some biters will need to continue wearing overlays, though they can be thinned down over time as the habit breaks its mental hold. Some people can graduate to a gel polish at this point, and perhaps eventually a regular nail polish if that's what they desire. It's important to keep seeing your nail tech for regular check-ups even after you've graduated though, to ensure your nails stay healthy, and tooth-mark free. Because I bite skin along with nails, I'm the type of person who needs to keep overlays on my nails to prevent me from being able to reach that skin with my teeth. I'm ok with that, overlays prevent the nail breakage that my very active lifestyle leads to. They're also more comfortable for my clients, as my sharp nails tend to pinch them when I'm holding their fingers if I'm not wearing overlays. You may find that like me, you want to keep your overlays on, or perhaps you'll be counting the days until you can be free of them. Either way, you'll have a lot more options once you've gotten into the habit of not gnawing on your nails. So, knowing that I've worn enhancements regularly for the last few years, and worn them consistently for the last six months, I want to show you something. Click on the picture of my nails up at the top of the page to bring up the larger version. My nails are a little dry in the picture because I had just soaked my overlays off before I took it, and the acetone leaves them a little flakey looking. Do you know what you're not seeing though? You're not seeing Rings of Fire, like you can see in the picture to the right here. What are Rings of Fire? Well, they're damage to the nail plate caused by a manicurist cutting into it with a file during a fill, leaving a crescent shaped channel in your nail that turns an angry shade of red. Many people believe that only electronic files can cause this type of damage; that is false. Aggressive, improper filing with a hand file can also cause this or very similar damage. Some people believe that any use of an electronic file causes damage to the nail plate; this is also false. Proper use of an electronic file will cause no harm to your natural nails. Case in point. I use an electronic file on my own nails as well as my client's nails, and as you can see in the full sized picture above, my nails are as healthy as they were when my matrix formed them. It is very important to avoid a nail tech who causes damage to the nail plate! Why? Well first off, it shows poor technique, improper use of tools, and puts the client (you) at risk for injury and infection. However, for a biter, it's doubly bad. Thinning out the natural nail in any way is going to make it more prone to breaking when the overlays finally come off. Broken nails are like heroin to a recovering biter, any rough spots are fair game to the teeth, and you're not going to be able to resist the temptation. So if you start seeing red rings under your overlays after your fills, it's time to have a frank discussion with your manicurist and perhaps look into finding a new one. So now you know everything you need to know about breaking the habit. Throw away the cyan pepper and 'No Bite' and stop in at Nailed It! or a quality salon in your area to see how we can help you. You'll love being able to show off your beautiful hands! After my last post, my proof reader (AKA my husband John) told me that I needed a reference chart, or a glossary, or something. You see, I'm kind of a stickler about using correct terminology, because to do anything else just confuses life later on. So this is just a boring, educational post that you can feel free to skip. I'm sure I'll be referring to it later on though, and if I ever use a term you're unsure of, just come on back here and look it up. To the left is a diagram I made in nail school to study for a test. I think it will work well for our purposes today. You can click on it to bring up a larger version if you'd like (as you can any of the images I post on the blog). Hopefully, it will help you locate the structures I'm talking about on your own nail. Free Edge: This is the part of the nail that extends over the tip of the finger or toe. Or, as in my case, gets chewed up by nail biters. Nail Plate: This is what most people would call the "nail." It's a plate of hardened keratin that covers the nail bed on the end of your finger. Cuticle: Is a film of dead tissue that covers the nail plate. It should not be confused with the living tissue of the eponychium. Cuticle creates a seal between the nail plate and the surrounding tissue, and prevents foreign materials and microorganisms from entering and causing illness or injury. 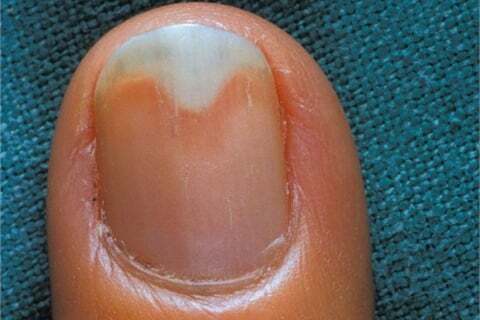 Eponychium: Is a ridge of living skin at the base of the nail plate. The eponychium should never be cut or trimmed, just gently pushed back. Hyponychium: This is the thickened skin between the fingertip and the free edge of the nail. This ridge of skin creates a protective barrier that prevents foreign materials and pathogens from entering and infecting the nail bed. Nail Bed: This is the tissue directly under the nail plate. It has a rich blood supply, which gives it a pinkish color, and is very sensitive due to the large number of nerves attached to it. Perionychium: Is the skin that touches, overlaps, and surrounds the nail. Nail Grooves: Are the tracks on either side of the nail, that the nail plate moves on as it grows. Mantle: Is a pocket at the base of the nail that holds the matrix. Matrix: is a group of cells that create the nail plate. You can see a little bit of the matrix under some of your nails. The half moons that are visible on the thumbs of most people (also called the lunula), are comprised of matrix cells. An injury to the matrix can affect nail growth in many ways, cause the nail to grow in an abnormal way, or it can slow growth or stop it all together. The overall health of your nails, begins in the matrix! So that's my little lesson today. There won't be a test, but we may refer back to this information from time to time.